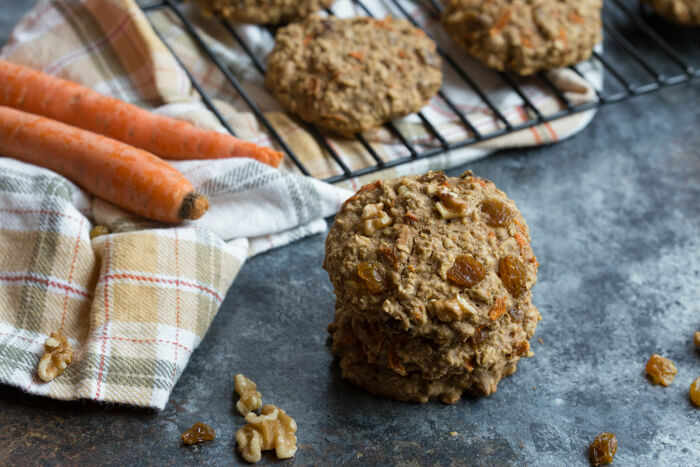 Carrot Cake Breakfast Cookies are having a moment in my breakfast life. Meaning I’ve been gobbling healthy oatmeal cookies up for days. Perks of the job. These oatmeal cookies are called breakfast cookies because they are healthy and you’ll feel good eating them all day err day!! Now, that’s my kind of cookie. What do you say? 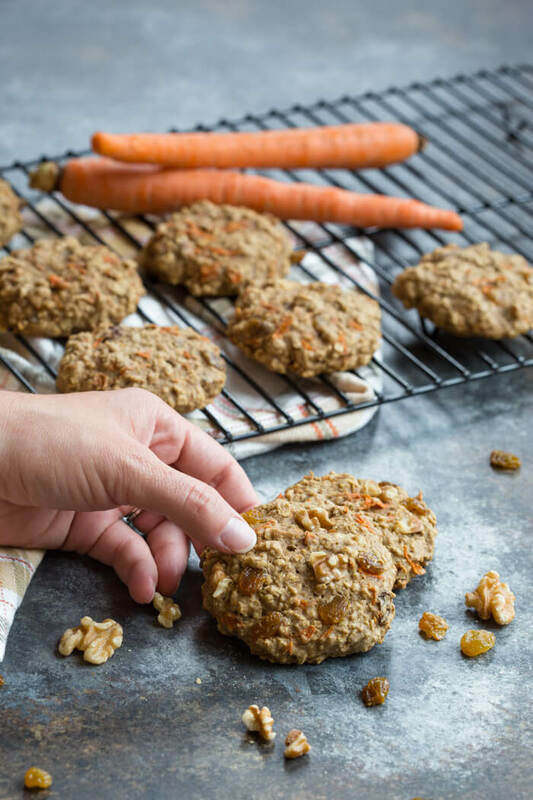 Parker and I are leaving on a jet plane to see family in South Carolina this weekend, and you better believe I’m packing these Carrot Cake Breakfast Cookies for the trip! Airport food can be the worst, so I’m planning ahead by packing some cookies for the plane. That’s what we are calling my baking habit these days. 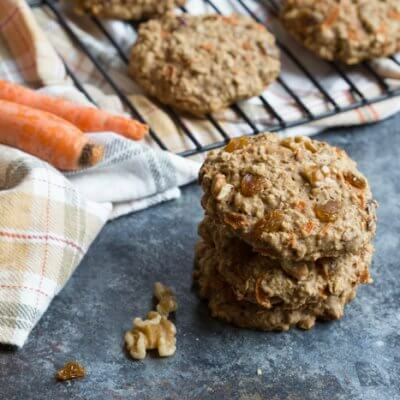 These Carrot Cake Breakfast Cookies are made with sweet carrots, oats, whole wheat flour, maple syrup, golden raisins and walnuts. 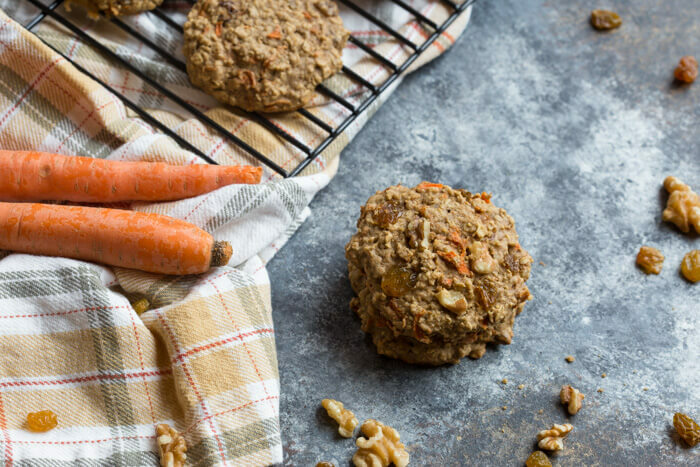 Love all the healthy fats, whole grains, and veggies in these cookies! They are so moist and perfectly sweet. I love the texture of these oatmeal cookies and the crunch and chew factor. 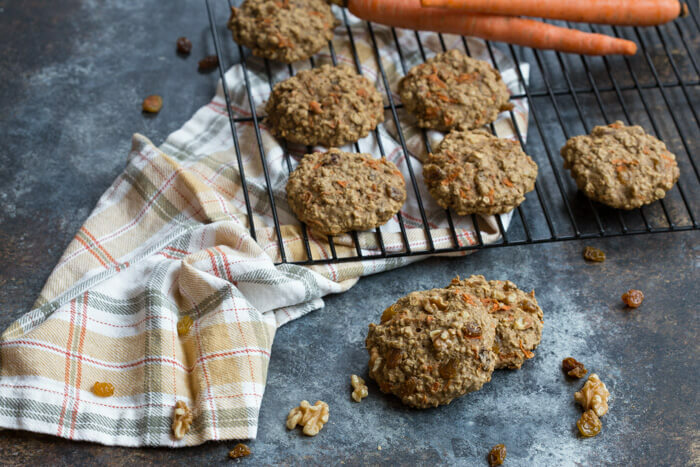 Carrot Cake Breakfast Cookies are straight up healthy breakfast cookie happiness. Add these cookies to your weekend baking– they are great for meal prep when you need a quick answer to breakfast. Pair with a hard boiled egg or cheese stick. That’s what we’re eating this morning for breakfast on the go. Preheat oven to 325 degrees F, and line baking sheet with parchment paper. In large bowl, whisk together oats, flour, cinnamon, baking soda, and salt. In separate bowl, whisk together butter, egg, vanilla, and maple syrup. Pour wet ingredients into dry flour mixture and stir just until combined. Fold in carrots, walnuts, and golden raisins until mixed. Spoon dough into 11 even cookies and gently press down, shaping if needed. Bake for 12-13 minutes until cookies are set. Allow to cool slightly before moving to drying rack. Store in airtight container. Cookies keep longer in refrigerator. 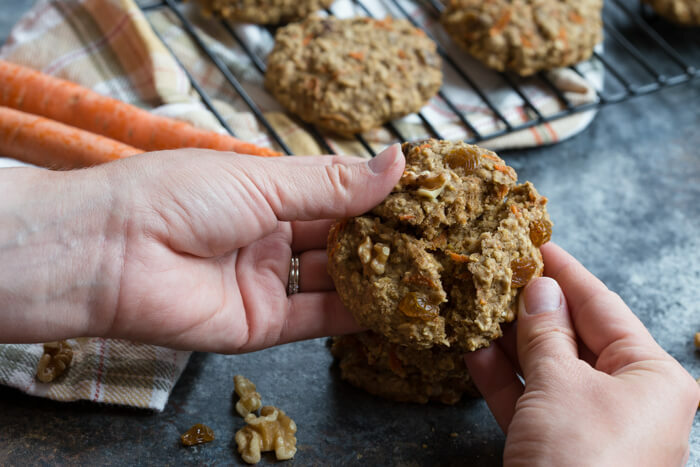 If you like this recipe, you have to try our Pumpkin Oatmeal Breakfast Cookies! Looking forward to making these. My market didnt carry white whole wheat flour, is regular whole wheat ok? White wheat is a bit softer, but whole wheat should be okay– please let us know how they turn out! Tastes awesome! I put the recipe in MyFitnessPal and they come in at 183cal per biscuit, which is so good! Tell me more about golden syrup! I haven’t heard of that before but sounds yummy! Thanks for sharing your feedback.. so glad you’ve enjoyed them. Can you tell me the nutrition info for these cookies? I can’t wait to try them! Hey Susan! 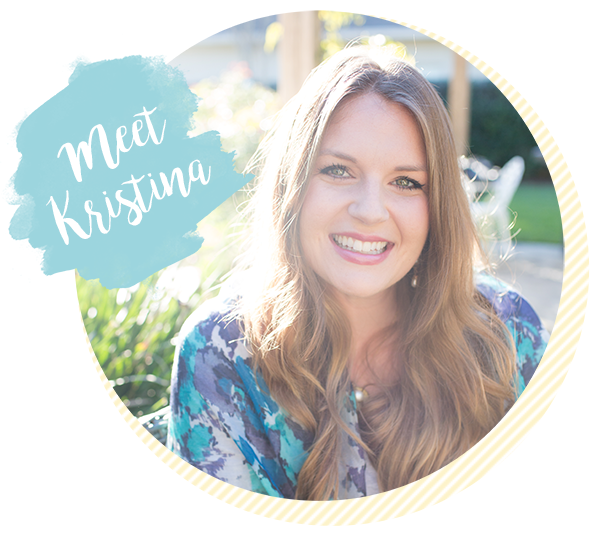 I nutrition info has now been added to the recipe card– hope you enjoy! haha– they didn’t in our house. I am in love with breakfast cookies! And carrot cake has to be my favorite. I must try these!!! Agree– hope you like them Lorie! Yum, these are perfect. 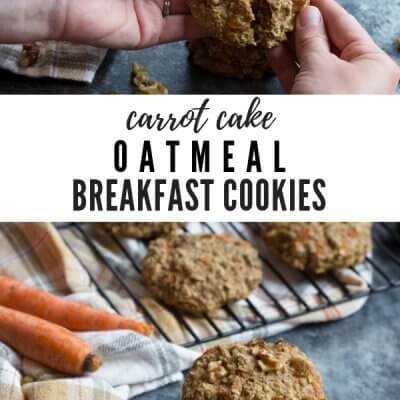 I love carrot cake oats so these sound great! Love that photo background, by the way!! I’ve been wanting to make something like this! Saved! 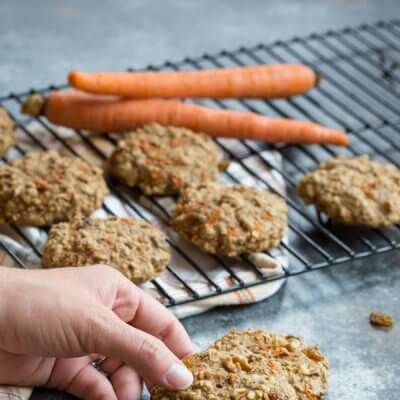 I LOVE sneaky veggie cookies! 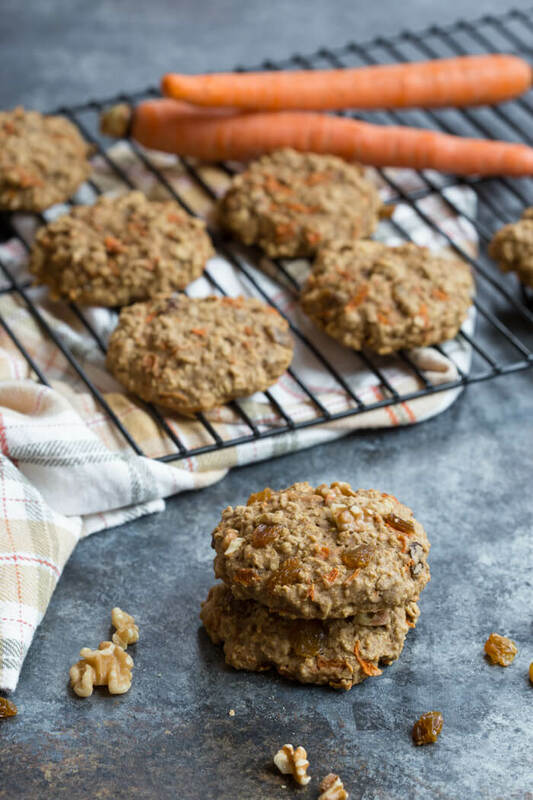 I make a zucchini breakfast cookie that my kids love, and I KNOW they would love these too! oooo. those sound really good! Obsessed with breakfast cookies! These look so delicious. 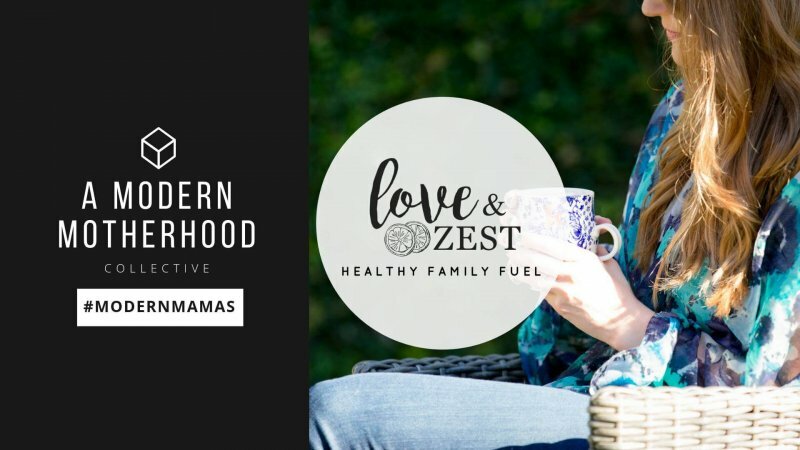 Would love to make them for my family soon! me too– they are super moist. My husband would looooooove these!